If that song played before professional sports games has taught me anything it’s that America is the land of the free. This was something I had to point out to Kitty as often as I could during our trip South of our boarder. Literally, I’d point to things, bus benches, dollar bills, Foot Locker stores and say ‘Freedom,’ because that’s what it represented. It’s the answer to everything in America. Why can’t American’s go to Cuba? Freedom. How can we ride a cable car down an insanely steep street in standee-only areas? Freedom. How’d that man get so obese? Freedom! Our big plan for today was to get on one of San Francisco’s famous cable cars, go for breakfast and enjoy life, because that’s what 2011 is all about. We got on a cable car near the Powell/ Market turnaround and hung on for dear life. We were both standees along with one young lady with the most awful hair extensions I have seen since my time in London. This girl was orange, had fake nails and surprisingly no British accent. I could have sworn I’d seen her on my favorite make-UNDER show Snog, Marry, Avoid, that’s how fake she looked. After surviving the cable car we got off near Washington Blvd to wait in line at Mama’s. It was cold, the people around us weren’t very chatty and did I mention that it was cold? I took a tour to City Lights bookstore which was only a few blocks away from our line-up. 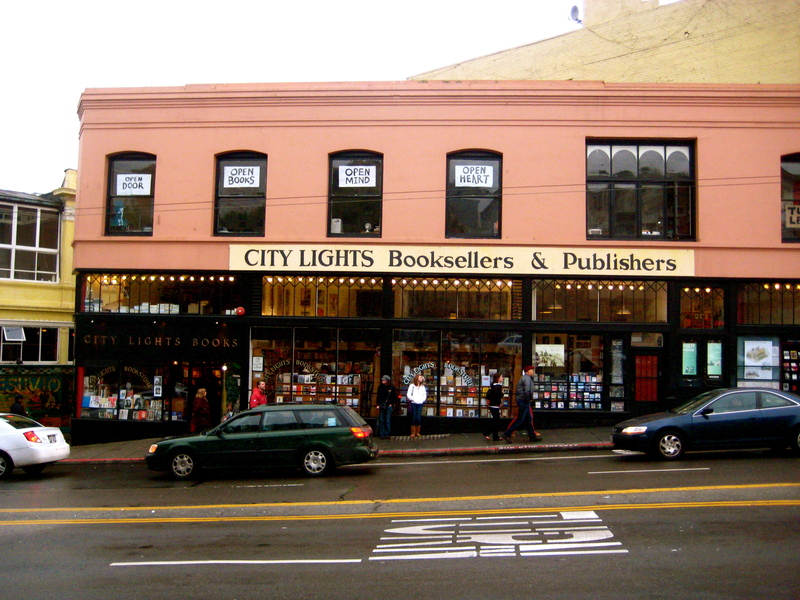 City Lights is famous for being the birthplace of beat poetry first publishing Howl by Alan Ginsberg. I bought a book; The Collected Stories of Lydia Davis, who is one of my new favorite writers. I also purchased a book bag so everyone will know what a literati I am when I walk down the street. After two hours or more we were finally seated. Luckily the breakfast was worth the wait. More fresh squeezed OJ and coffee! Kitty ordered the french toast sampler made with banana bread, cranberry bread and some other yummy kind of bread. I’m more of a savory breakfast girl so I ordered the veggie Benny which came with avocado, mushrooms, spinach and tomato, a side of fruit and hash-browns. After we ate we rode the cable car further down the hill to Fisherman’s Wharf where I learned that San Francisco is the birthplace of sour dough bread. Or at least that’s what Kitty told me about the Boudin Bakery that’s located there. Then as it was still cold, even colder because we were by the water looking at Alcatraz Island, we needed to warm up by drinking hot chocolate from The Ghirardelli Chocolate Company. Freedom! My flavor choice was caramel and sea salt. It tasted like a party in heaven. Our late afternoon was spent indoors trying to warm up watching the movie Black Swan. That’s the one where Natalie Portman plays a deranged ballerina. That’s all I have to say about that. 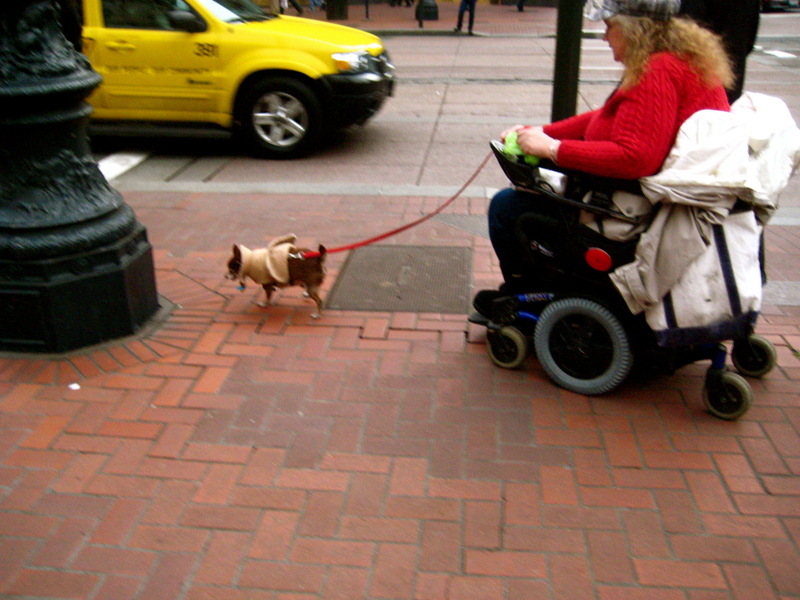 San Fran woman walking her dog. Our day was lovely and very event filled but it was the evening that was the highlight of the first day of 2011. We went for karaoke at Mint, which according to their website is ‘one of the world’s best known karaoke lounges.’ When we walked in I instantly hated the place. As a recent convert to karaoke clubs, I found this place very intimidating. It was full of douchebags, or that was my first hit. Kitty put in her song right away and feeling awkward, I refused. After 20 minutes of watching the crowd and downing a highball, I got the courage to put in my song. Karaoke in America is very different than here in Vancouver, Canada; granted I’m judging this based on two places, San Fran and New York. In America you are singing to a crowd. They are right in front of the stage, they are dancing and they are in to it. You get a chance to be a rock star. This night at the Mint, we were rock stars. Kitty had the crowd in the palm of her hand with her rendition of Alone by Heart. Everyone was coming up to her afterward complimenting her – which is something people rarely do in Canada. One guy wanted her to sing it again with him. It was adorable. At that point my mind was completely changed about The Mint, but it was much too late to get in another song. That’s the downside of these busy clubs. However, the guy that wanted to sing a song with Kitty ended up getting me to sing with him. We sang “Strongly, Madly, Deeply” by Savage Garden. We later found out that this guy was a soon to be dot-com millionaire; the CTO of Dropbox. Of course he was, this is San Francisco aka the Silicon Valley. Home of Google, Apple computers, eBay and so much more! On a side note, Kitty is a big fan of Dropbox. Apparently it’s like YouSendIt only better. The next highlight of the night was walking home past a woman who mumbled in her craziness ‘sh*t, sh*t, sh*t, goddamn, goddamn, happy new year, sh*t.” This became the catch phrase of the next 24 hours. With our egos inflated we ended January 1, 2011 enjoying the freedom that is America.